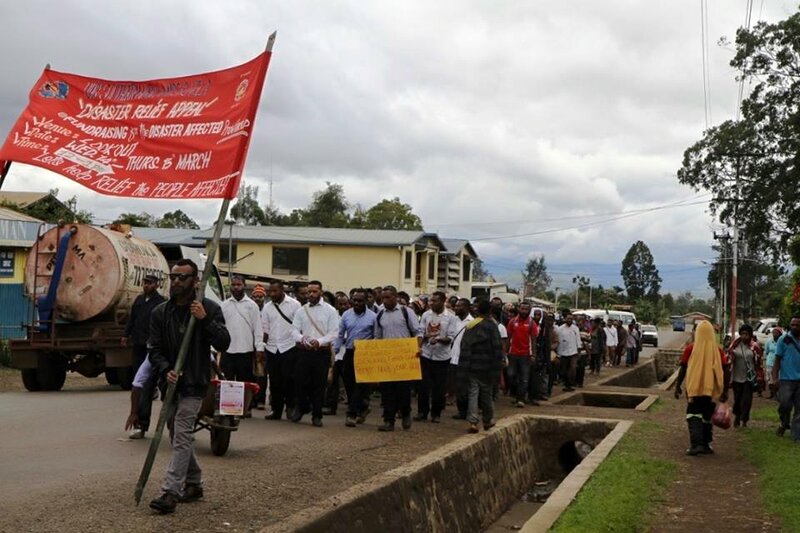 The student body from all primary to tertiary institutions in the Eastern Highlands Province joined hands in an Earthquake Relief drive for the victims of the recent Earthquake in the Hela and Southern Highlands Province. The Relief drive started last week and ended on the 16th of March with a wheelbarrow push around the town that saw the participation of students from the University of Goroka, Highlands School of Nursing, Goroka Technical College, Kamaliki Vocational School, including primary and secondary schools with their teachers. Disaster Relief coordinator and Patron of the SHP & Hela Students Association (UOG) Mr Stanley Nandex said the perception and the response within EHP and around PNG was overwhelming. The members of the EHP Disaster Relief Committee consist of students and lectures representing each district in the two provinces and they were tasked to collect data & statistics which they did and that information will be used to purchase the much needed supplies in those areas. Nandex said the relief supplies whatever it may be, will be will be deployed to those affected areas with the assistance from the Emergency and Disaster Relief office in Mendi. On the same note the Disaster Relief executives have held meetings with Rotary International office Goroka to work together for the transportation of the goods and services to these affected provinces. The Rotary International office in Goroka will be transporting the relief supplies to the affected provinces. Student President of SHP/Hela Mr Ronald Martin stressed the risk of those supplies arriving at the right location and in the hands of the right people.